“There are few hours in life more agreeable than the hour dedicated to the ceremony known as afternoon tea." Henry James, The Portrait of a Lady This thoroughly British tradition is one that can be enjoyed by all - who doesn't enjoy a slice of cake or an iced bun accompanied by a fragrant cup of something warm? A traditional Afternoon Tea consists of a pot of tea, scones with jam and clotted cream, sandwiches and a selection of cakes, and generally requires advance booking. However, Afternoon Tea has evolved over the years and now there are a great range of options - from Champagne Teas for a special occasion, Cream Teas, Vintage Teas and more. The only real question is - which comes first, the jam or the cream on your scone? The Maple Restaurant at Greshams in Ipswich is open 7 days a week and offers freshly prepared favourites from Bacon and Courgette Tagliatelle, to an extensive Burger Bar, plus a weekly changing dessert menu, Sunday carvery, children's menu and a delicious afternoon tea including a gluten free option. Enjoy Afternoon Tea at Stoke by Nayland Hotel all year round - out on the terrace in the summer sunshine soaking up the views of the championship golf course or in the Lounge Bar next to the applewood fire in the winter. You will be treated to finger sandwiches, homemade fruit scones with fresh clotted cream and jam, chef's mouth-watering cakes and freshly brewed coffee or tea. 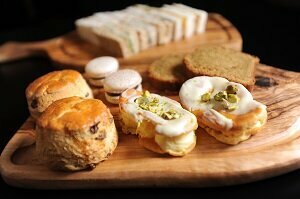 You can also upgrade to a Sparkling Afternoon Tea and add a glass of fizz. And if that wasn't enough indulgence, why not try the ultimate treat... The Chocoholic's afternoon tea! Including: Sandwiches, incredible handmade chocolate themed treats such as Chocolate and cherry scones with chocolate and praline spread and Jaffa cake macaron and your choice of drinks (including hot chocolate of course!) This can also be upgraded to include a glass of fizz. Advance booking only. 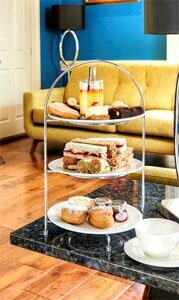 Stoke by Nayland also offer Afternoon Tea vouchers so that you can treat family and friends to a slice of the luxury! Afternoon tea served 7 days a week between 2.00pm - 5.00pm. Including a choice of teas or coffee, finger sandwiches, mini sausage roll, fruit scone with strawberry preserve & clotted cream and mini sweet treats. Add a glass of Prosecco to make it extra bubbly. For the finest tea or a glass of Champagne with a delicious selection of sandwiches, cakes & scones served in Kesgrave Hall lounge area or outside on the terrace. Available any day between 3-5pm, and there's no need to book. The Westleton Crown is a country Inn in a delightful village close to the Suffolk Coast, so you can work off your Tea or work up an appetitie for it by strolling around Westleton during your visit. The Crown serves a delightful Cream tea from 3pm until 6pm which includes Homemade scone with their own strawberry jam and vanilla cream, sticky toffee pudding cake and shortbread and a large selection of teas, or a glass of champagne. This is one of our finest Hotels, set in magnificent grounds which you can enjoy during the summer months, or snuggle up in front of their open fires in one of their sumptuous stately lounges during the winter. Tea here will be a very special occasion - Suffolk's equivalent of the Ritz! Offering a traditional Afternoon Tea with finger sandwiches, homemade fruit scones with clotted cream and preserves, homemade cakes and a choice of tea, tisanes, coffee and luxury hot chocolates or for the ultimate treat how about a Champagne Afternoon Tea which includes 3 tasting glasses of Laurent Perrier Champagne. 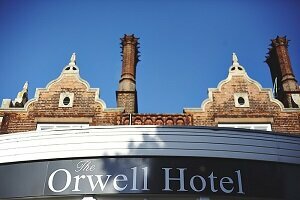 Both served daily from 2pm-5pm, must be booked in advance. Have you had Afternoon Tea in Suffolk? Let us know what you think by Sending Us an Email.